1. Start with a ripe avocado. It should feel soft, but not too mushy. If it’s not quite ripe, put it in a paper bag, close it up, and leave it on the kitchen counter (not in the fridge) to ripen. 2. A grown-up should cut the avocado in half with a sharp knife. 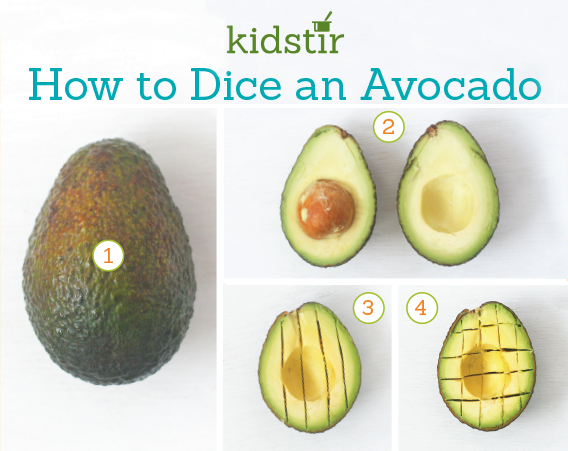 Twist the cut avocado into two halves. Pop out the pit with a spoon. 3. Hold one avocado half, cut side up, in the palm of your hand. Use a butter knife to cut long lines down the avocado. 4. Next, cut lines across the avocado, as shown. Then scoop out the diced avocado pieces with a spoon.